Let's take a break this month and enjoy some vintage photography. 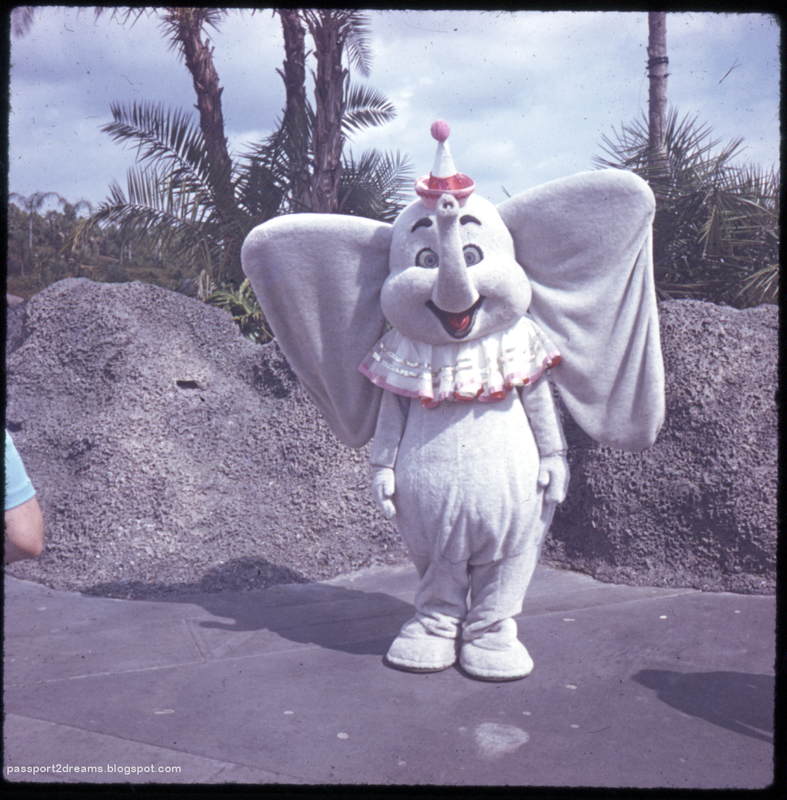 I don't do this sort of thing all that often, not only because it's fairly time consuming, but most often vintage vacation slides aren't all that great. There's almost certain to be a wide array of throughly mediocre parade and Jungle Cruise shots, and what with the state of photography until the late 80s, most often blurry or out of focus. 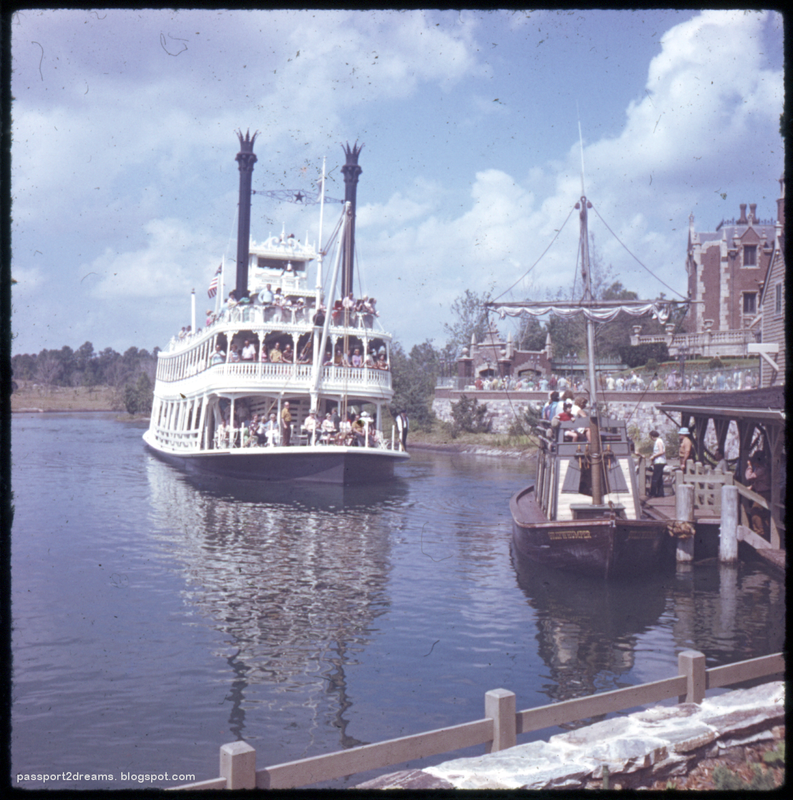 But sometimes you luck out, and you come across a batch of slides not only properly exposed and well framed, but which capture interesting and relevant details of the parks, and this is what I have for you today. I bought these slides from Mike Lee, who had given up on properly digitally scanning them, and after sorting out all of the various vacation trips into neat categories it was clear these were both ambitious and interesting. Let's take a look. We first encounter our heroes in the Hub, where they are preparing for the day. 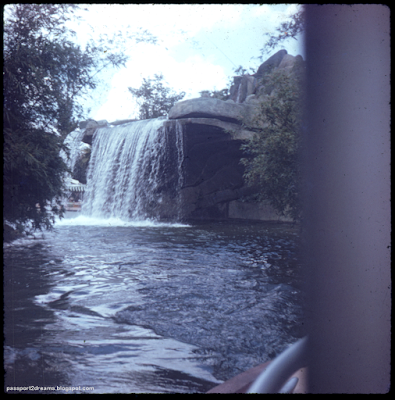 This shot provides not only an excellent view into the vacant rear expanse of tomorrowland, but the light catches on the waterfall just right and really drives home how cool those must have looked when they were operating properly. Within a few months Disney would drain these and install little bumps all down the surface of the falls to make the water more visible, which really only had the effect of getting everything around them wet. But in the first months of 1972, you can really see this feature working properly. The Grand Prix was their only shot in Tomorrowland. There probably isn't a worse attraction boarding area at Magic Kingdom, then or now. 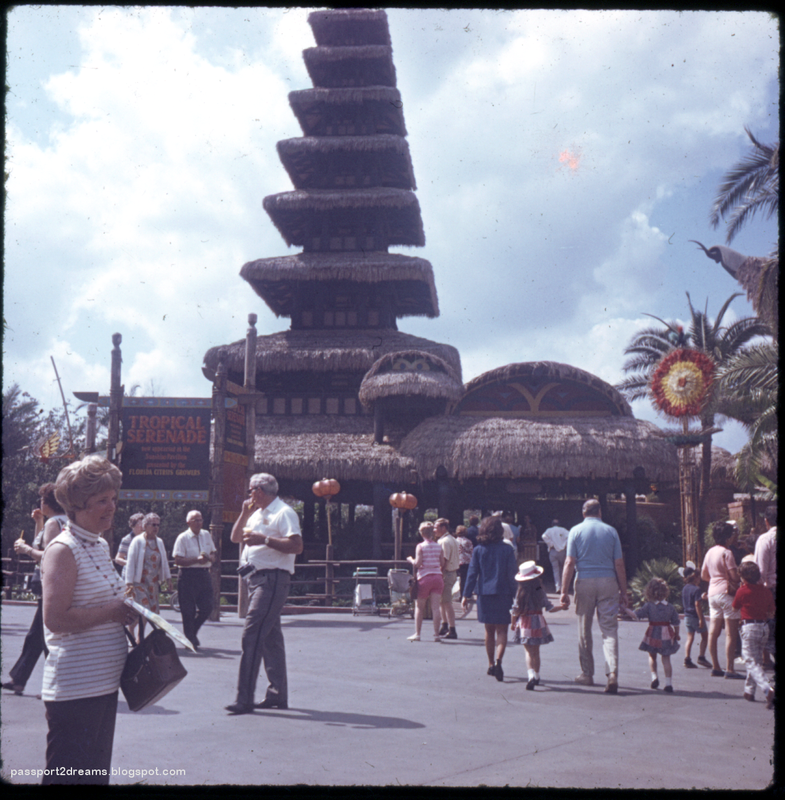 In 1973, the attraction would be refurbished and murals would be added to those plain rear walls. 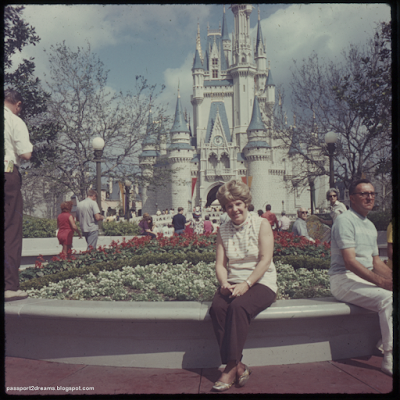 Every so often, I see a photo like this that reminds me that the boarding area's sole decorative embellishment - that car on a tiny pedestal along the rear wall - has been there fire nearly five decades. Up until the Indy car sponsorship of the 90s, the spotter on the elevated platform would wave a big checkered flag and everyone would pull out of the load area at once, which was a cool touch. I guess in defense of the Grand Prix, real life race tracks aren't very attractive either. On to Fantasyland, with some fun character shots. 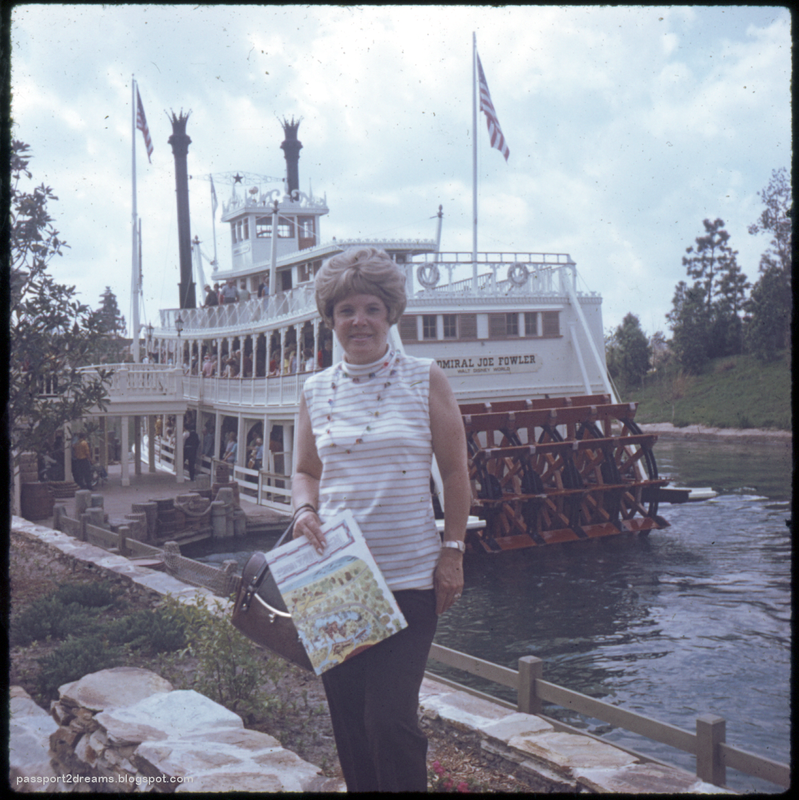 You can tell this is an early 1972 set because throughout our heroes are posing holding the large fold-out Magic Kingdom map. The first GAF Guide was not printed until Spring 1972, so early visitors either had to spring for the large fold-out wall map or use the map printed in Walt Disney World News. Here's Kids of the Kingdom performing at Fantasy Faire. At this point they may still have been known as The Kids Next Door. This is the exact lineup of performers who also appear at The Top of the World at the end of The Magic of Walt Disney World, which I think is pretty cool. Fantasy Faire was a bandstand with a raising and lowering stage, exactly like the one still in use at Disneyland Tomorrowland. 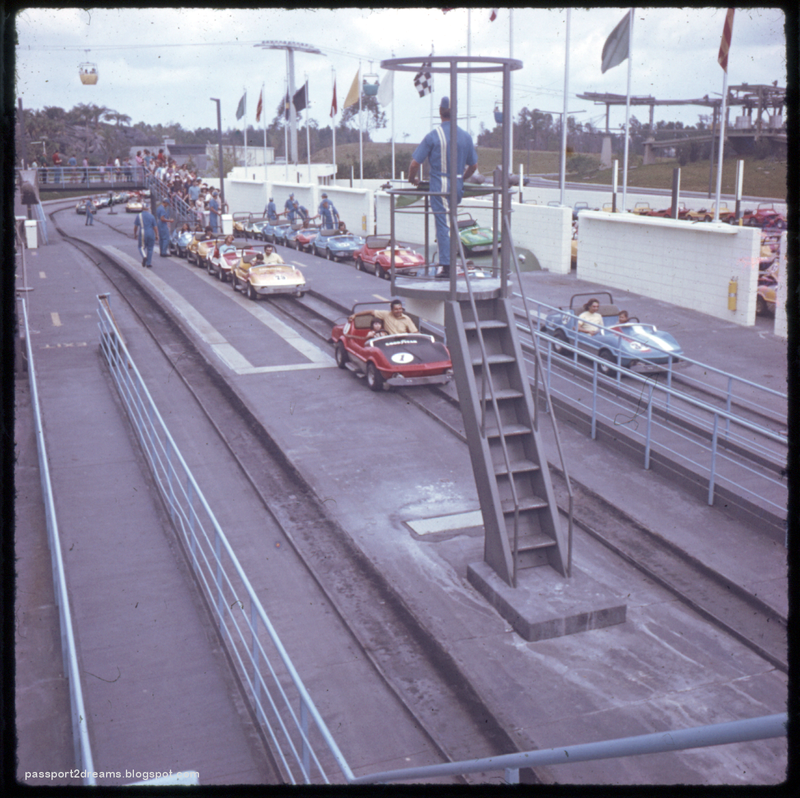 Anybody who insists that the Haunted Mansion's stretching rooms had to be redesigned to go up due to the water table, remind them that Fantasy Faire and Tomorrowland Terrace used identical Otis piston elevator platforms in 1971. Fantasy Faire continued to host performing groups and stage shows until it was demolished to make way for Ariel's Grotto in 1994, which itself was demolished for New Fantasyland in 2009. 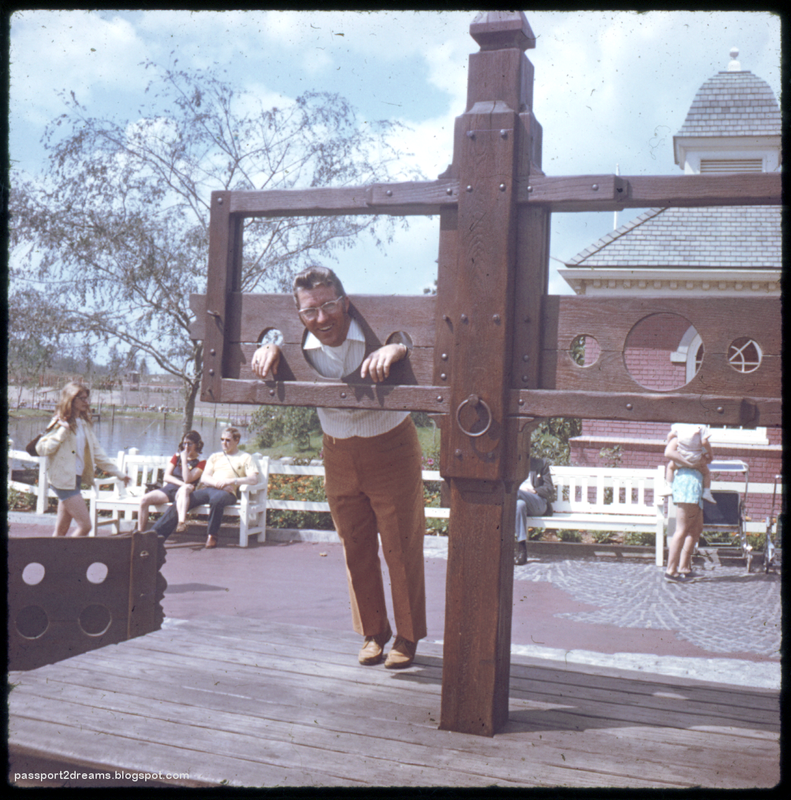 I'm not sure when the stocks were widened to allow you to stick your head in them, probably within the first few months after opening. If there any Disney thing that's been more widely copied than this simple gag? If you look waaaaay in the background, you can see the white construction wall surrounding the Frontierland Train Station. 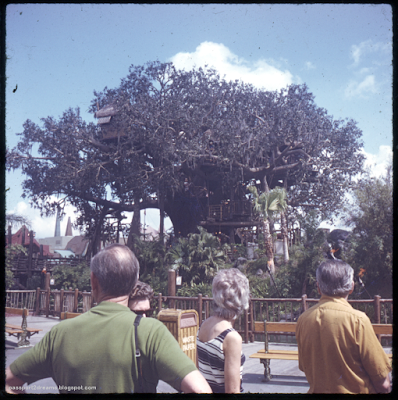 The Haunted Mansion's rain canopy would not begin installation until March or April 1972. 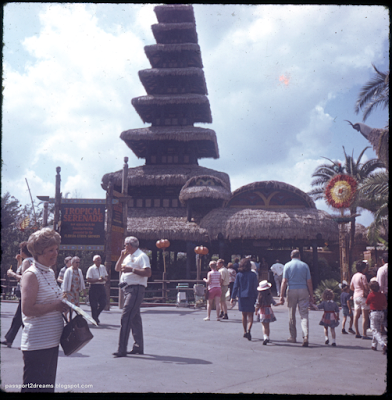 I love these early shot of the Mansion way out on the edge of nothing. 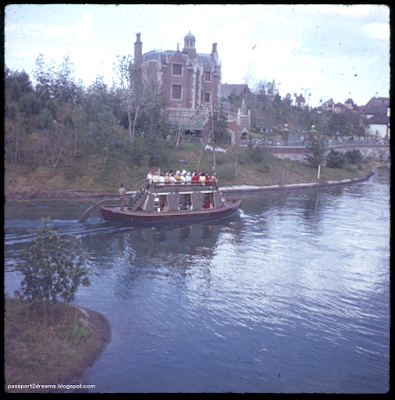 The glass windows were originally red, but they were changed at some point early on. When the facade was rebuilt in 2016, they brought the red panes back, which I thought was a great touch. Here's a rare view from the line for the Hall of Presidents! This is around the west side of the building, between the colonial home facades and the "village green". The green would be partially removed to build the covered waiting area later that year, and fully removed to be replaced by the current circular planters and tables by 1980. 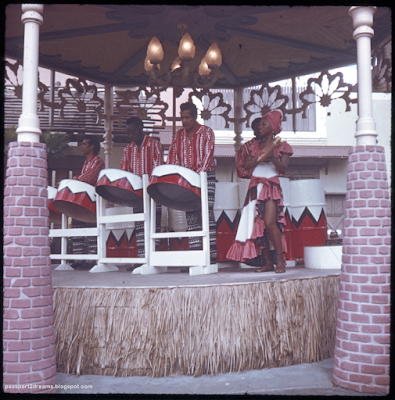 If you don't recognize this band stand, I posted a lot of information about it earlier this year. Standing in line for the Jungle Cruise. Notice that Disney has split the courtyard with benches and trash cans, forcing exiting traffic to proceed up the hill towards the Treehouse. 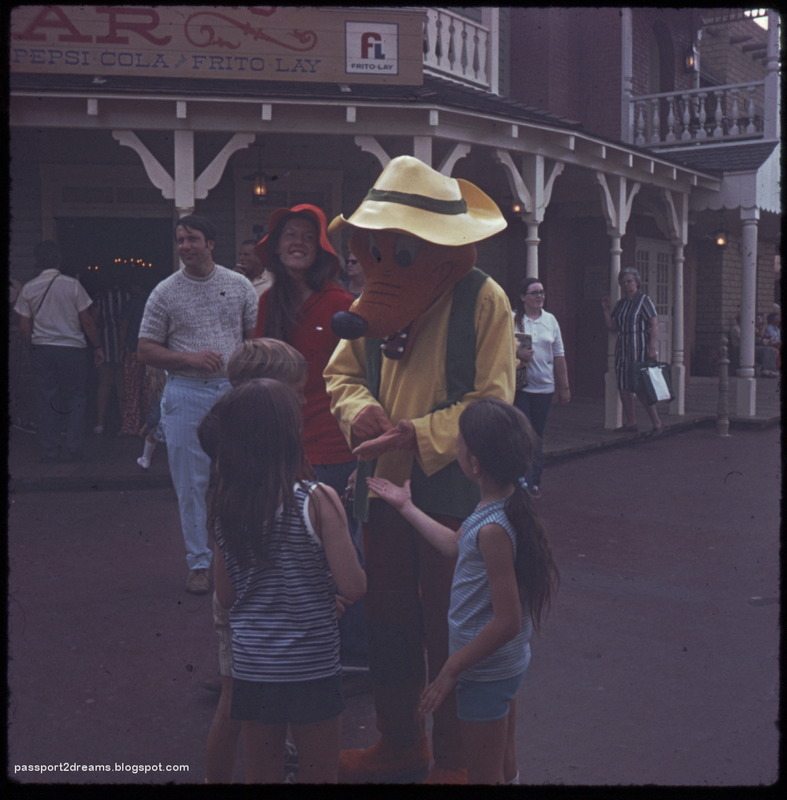 You can also see those butane torches that used to burn all over Adventureland. I remember them lasting until the late 90s, but I'm not sure when they went away for good. It looks like it's astro-turf on the ground around the tikis. 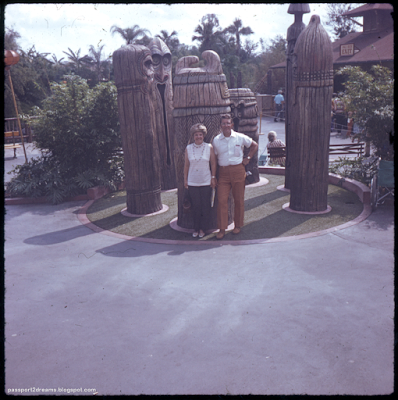 This would be relocated nearer the Tiki Room in just a few months, but it does look really fun to go into this circle. Marc Davis was a very underrated designer of simple interactive elements. Over at the Tropical Serenade, it's February or March 1972 and still no Barker Bird. 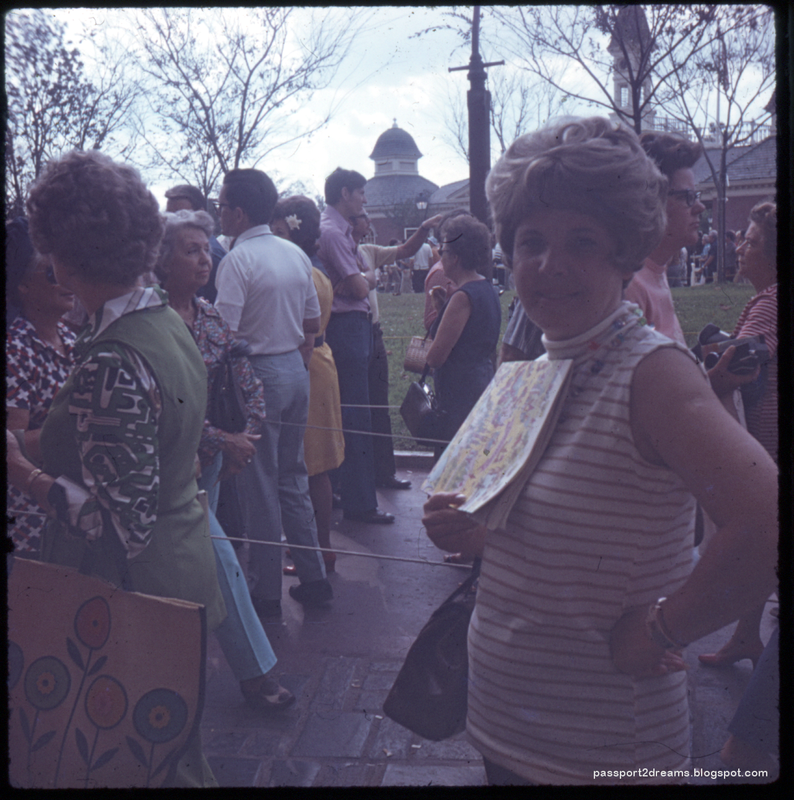 I believe it was somebody in Operations who made the call to add him to draw attendance to the show; it was definitely in place by June 1972. Nearby, Country Bear Jamboree is the runaway success of Magic Kingdom! One interesting but little-reported detail is that originally, Tropical Serenade was an E-Ticket and Country Bear Jamboree was a D-Ticket... until January 1972, when the ticket prices of the two attractions switched! Hall of Presidents and Mickey Mouse Revue did the same thing at the same time, for pretty much the same reason. I love this shot. 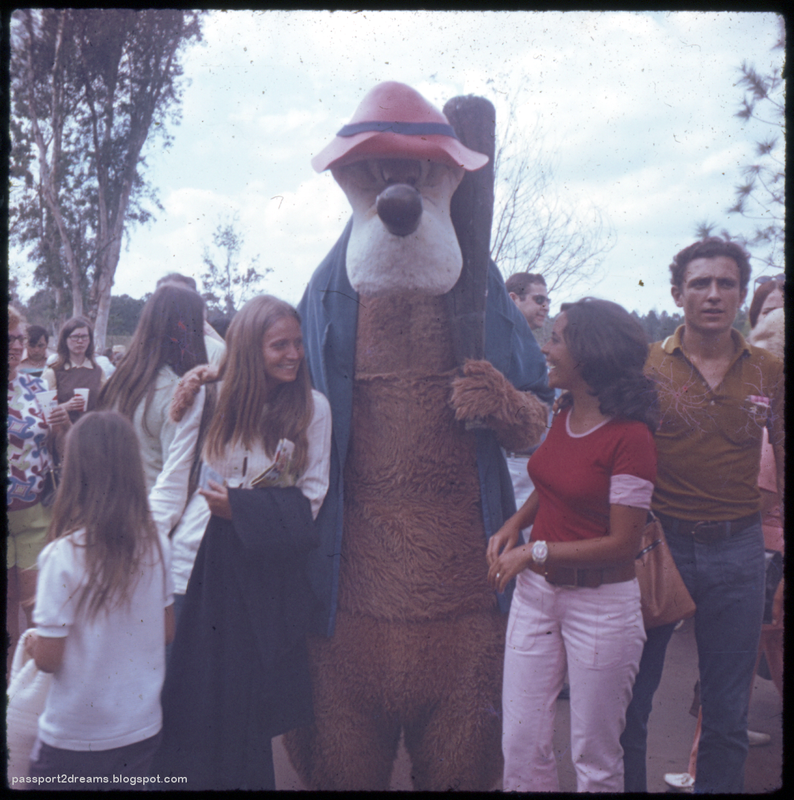 I've seen hundreds of vacation slides and only these folks thought to photograph that indelible part of any theme park trip - waiting in line. Entertainment guides from early 1972 call these folks the "Mariachi Band", although the 1972 "A Musical Souvenir of Walt Disney World's Magic Kingdom" lists them as Mariachi Chapparal. The group that performed at the Contemporary was officially known as Los Gallos, but they probably shared personnel. The facades of both Bear Band and Jungle Cruise were intended to house performing groups in this way, although the Adventureland Steel Band would only perform above Jungle Cruise for one day before being moved elsewhere. 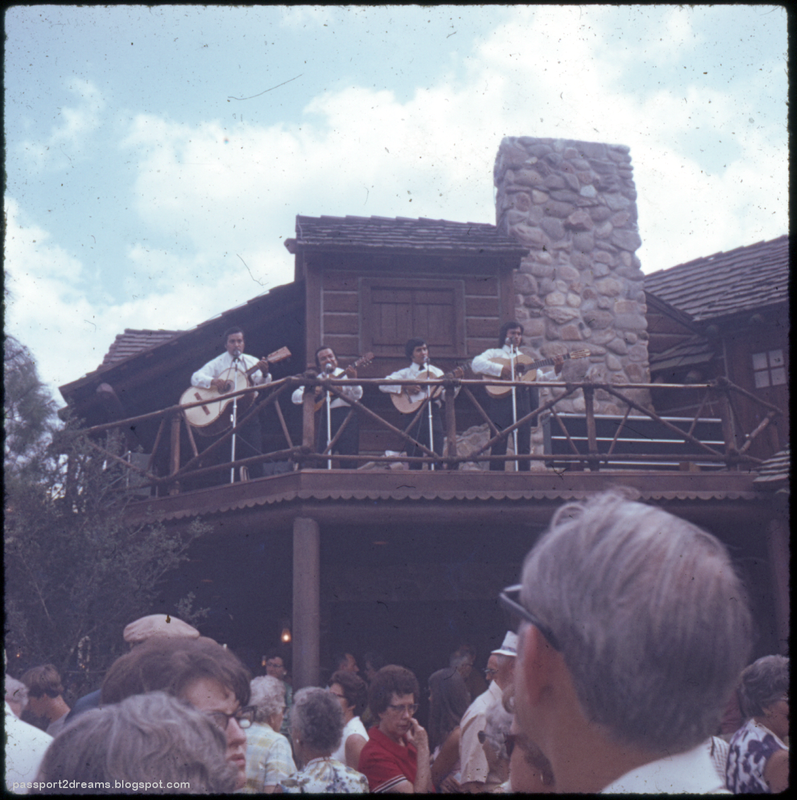 I've also seen a "Safari Band" performing on the veranda above the Juice Bar at the entrance to Adventureland. I think this is a very clever way to provide musical entertainment without having to stop the park in its tracks. It's getting late at Magic Kingdom and the lights are on now, so after a brief visit with Brer Fox and Brer Bear it's time to head back home on the monorail. 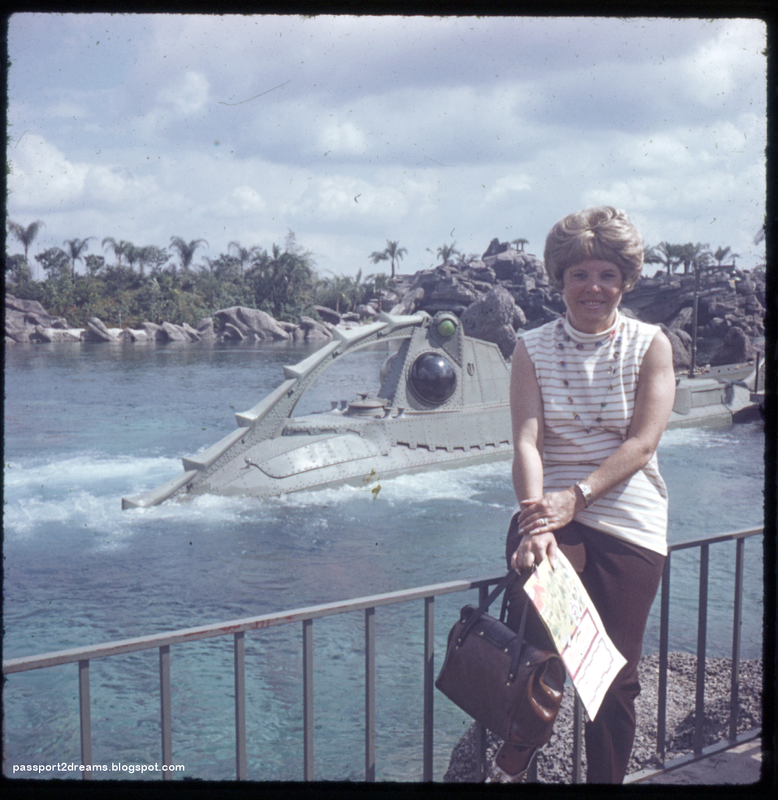 Thanks for joining our unnamed heroes on their adventure through Magic Kingdom as it was almost 45 years ago, and thanks to our heroes for thinking to take such fun, interesting photographs! 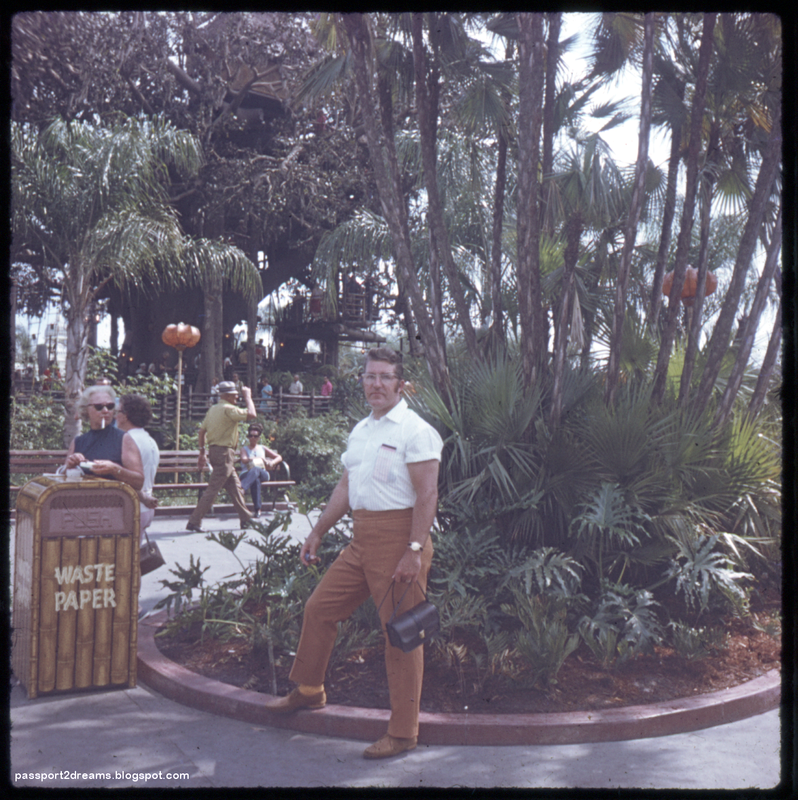 I have a few other similar posts on this site's Walt Disney World History Hub, so if you enjoyed this there's more to be seen out there! until next time! 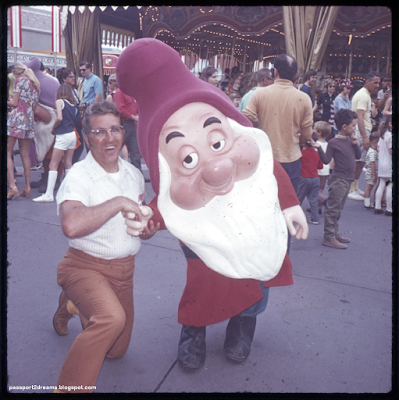 Where was that Fantasyland bandstand located? This was a wonderful read! Thank you for putting in the time to do this, I know history articles are very time-consuming! 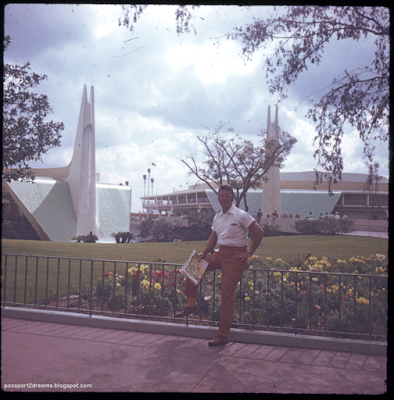 I did one about Tomorrowland in Disneyland in the 1950's and it took me ages, but it was so worth it! Your blog is simply the best! Thanks for all you do! By the way, when you say that the Mansion facade was 'rebuilt' in 2016, do you happen to how extensive that was? Like, ripped up down to the studs? Mostly I'm amazed that these people seem to be having such a good time in spite of having to wait in very long lines with no shade. 1970's tourists were made of sterner stuff clearly. I loved this post, especially your commentary!! Thanks for sharing such awesome photos. Would love to see more posts like this! 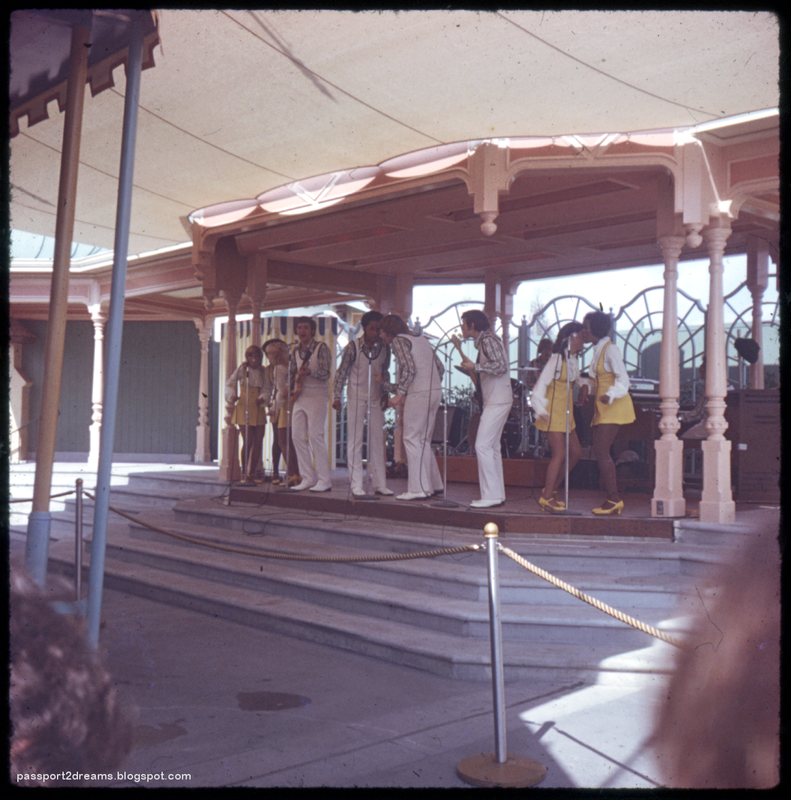 To answer "Unknown"'s question, the bandstand was part of Fantasy Faire, which was to the right of the Pinocchio bathrooms (and behind Dumbo and the Carrousel). It stretched over towards the 20,000 Leagues lagoon. The main tent housed tables, the bandstand to the back, and a food tent to the right. I always thought of the complex as the MK's version of Carnation Gardens at DL. The water table story really doesn't make sense, since the Magic Kingdom is built on the "second floor" over the utilidors anyway. Our guy is such a great ham for the camera. I love his kneel with Sleepy and his grin in the stocks. That Tomorrowlaand entrance brought me to tears with its beauty the first time I saw it in 1983, and pictures of it do the same to me now. It was like stepping into a city in the sky. I would love to see more posts like this; as others have already said, the pictures are fun, but it's your commentary that makes them extra special. These photos are fantastic, and make me nostalgic for a time in the parks I wasn't even around for. 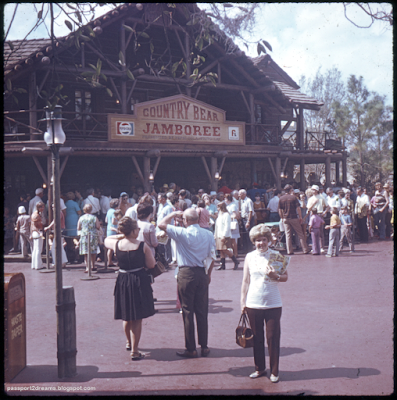 The shots of the Tomorrowland entrance, Country Bear Jamboree with a line(!) and the veranda entertainment bring a smile to my face. Thanks for taking the time to go through these and thanks again for sharing! Not related to your post, but I'm a die-hard (DL) Haunted Mansion-head..though I've never ridden it (I understand there's a few of us). 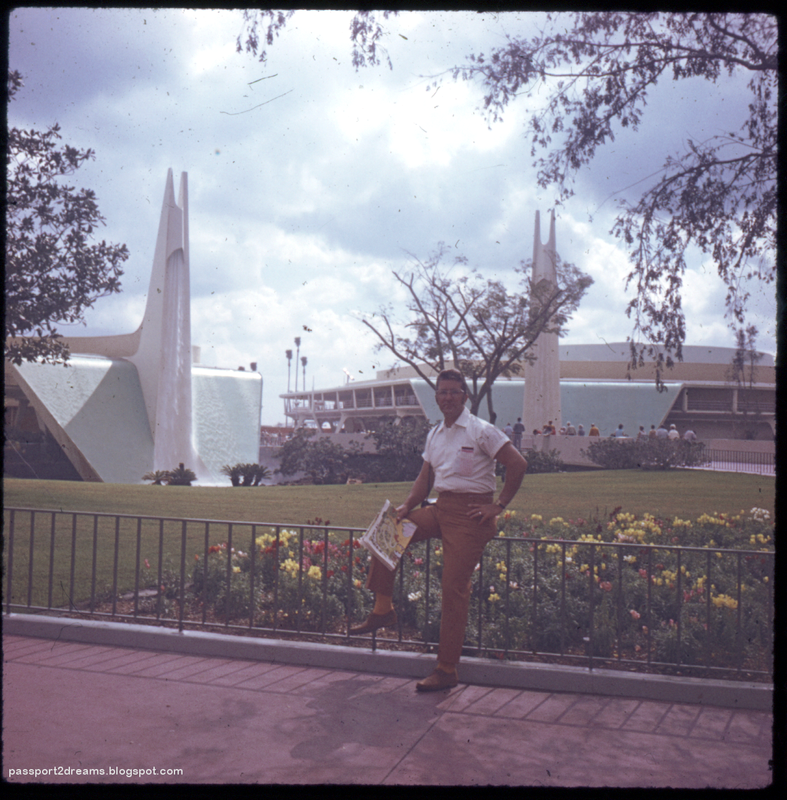 Regardless, I really appreciate your very eloquent thoughts on why Walt's park legacy needs to be kept alive and discussed.